General circulation models and high resolution regional climate models (RCMs) are being used to simulate climate of the recent past and to project future climate change across the northeastern US. We are interested in the timing of changes regionally, as compared to the changes occcurring nationally and globally, and the patterns of key parameters that are of relevance to natural systems (frost occcurrence, snow cover, drought, fire hazard conditions, etc). We are also assessing the consistency of climate models in simulating recent climate changes, in order to improve confidence in future scenarios. Karmalkar AV, Bradley RS. 2017. Consequences of Global Warming of 1.5 °C and 2 °C for Regional Temperature and Precipitation Changes in the Contiguous United States. PLoS ONE 12(1): e0168697. Ning, L., R.S. Bradley. Snow occurrence changes over the central and eastern United States under future warming scenarios. Scientific Reports, 2015. Karmalkar, A., R.S. Bradley, Contributions to the report: Integrating Climate Change into Northeast and Midwest State Wildlife Action Plans (chapter on Regional Climate Changes), 2015. Fan, F., R.S. Bradley, M. A. Rawlins. 2015. 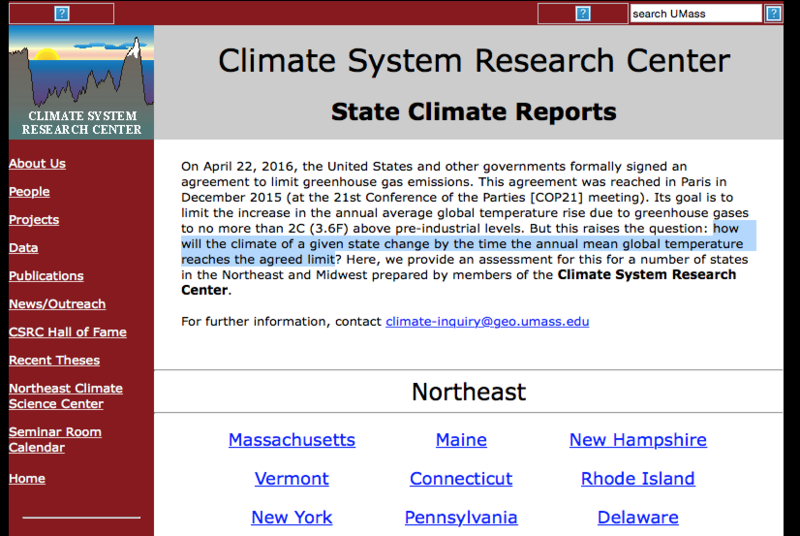 Climate Change in the Northeast United States: An Analysis of the NARCCAP Multimodel Simulation. J. Geophysical Research-Atmospheres. Fan, F.X., R.S. Bradley and M.A. Rawlins. 2014. Climate change in the northeastern U.S.: regional climate model validation and climate change projections. Climate Dynamics 43, 145-161. Karmalkar, A et al: Interpreting results from the NARCCAP and NA-CORDEX ensembles in the context of uncertainty in regional climate change projections; AGU Annual meeting, New Orleans, Dec 2017.